FILE - Venezuelan migrants walk along the Ecuadorean highway to Peru before new rules requiring they hold a valid passport kick in, at Tulcan, Ecuador, Aug. 21, 2018. 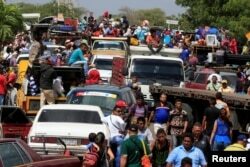 The United Nations says that more than 1.6 million Venezuelans have left their country since the start of 2015, generating an international migrant crisis that has set off alarms in South America and recently led to violent confrontations between migrants and local populations. Here are some facts about Venezuela's migrant crisis. Most migrants say they are escaping Venezuela's imploding economy. Hyperinflation has decimated wages, and more than a decade of price controls have generated widespread shortages of basic goods. Venezuela's monthly minimum wage is currently worth about $25 and is far below what is needed to feed a family. More than half of Venezuela's migrants are leaving for neighboring Colombia. But hundreds of thousands also look to settle in countries further south, including Ecuador, Peru and Chile. A smaller portion of the migrants is leaving Venezuela via its remote, southeastern border with Brazil. More than 28,000 also filed asylum petitions in the U.S. last year alone. FILE - Venezuelans line up to cross into Colombia at the border in Paraguachon, Colombia, Feb. 16, 2018. ​What is the scale of the problem? The United Nations' refugee agency says that around 5,000 people are leaving Venezuela every day. Close to 1 million Venezuelans are already living in Colombia, according to the country's immigration authorities. By comparison, at the height of Europe's migrant crisis in 2015, Germany took in 900,000 refugees from Syria, Iraq and Afghanistan. Turkey currently houses around 3.5 million Syrian refugees. The impoverished northern Brazilian state of Roraima declared a state of emergency last year after 30,000 Venezuelans arrived in the state capital, which has a population of 350,000. Brazil's federal government has sent the army to provide humanitarian assistance and stem violence between locals and migrants. Ecuador has also declared a state of emergency in three of its provinces. Initially, neighboring countries facilitated the arrival of Venezuelans by granting temporary work and residence permits. But as the exodus has grown, some have tightened entry requirements. Ecuador and Peru said in August that only Venezuelans with passports could enter their territory, a measure that could bar many would-be migrants from a country where passports are hard to obtain. 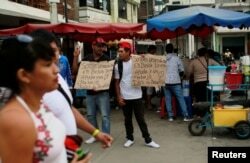 FILE _ Venezuelan migrants hold signs that read "We are Venezuelans looking for help and a job, God bless you" at the border with Ecuador, in Tumbes, Peru, Aug. 24, 2018. ​What does Venezuela's government say? Venezuela's socialist government denies there is a migrant crisis, with Vice President Delcy Rodriguez recently declaring that images of desperate migrants walking across Colombia were staged by Venezuela's enemies to justify an intervention. President Nicolas Maduro has urged his country's emigres to ``stop cleaning toilets abroad'' and return home. In August, he sent a plane to Peru to pick up around 100 migrants who he said had been duped into abandoning Venezuela.